Most 4K/UHD productions to date have used the square-division method where the full image is divided into four quadrants. This requires all four HD-SDI images to be correctly timed otherwise the 4K/UHD picture will look like four separate images. One engineer we spoke to commented that the process was "...like going back to the days of analogue RGB, where you had to align the red, green and blue channels. Now, we have to align four HD-SDI signals. Haven't we learnt anything?" With our LV5490 4K/UHD/3G/HD/SD SDI waveform monitor, it is simple and intuitive to set up square-division 4K/UHD correctly. The instrument addresses this by firstly having a built-in 4K/UHD test pattern generator, with moving-box and picture-scroll settings. This allows a production team to align the four HD-SDI sub-images with confidence. It also means that a standalone test pattern generator is no longer required. Equipped with eight input connectors, the LV 5490 accepts up to two 4K signals simultaneously. In the 4K/UHD video format mode, 3G-SDI dual link or quad link is supported. It has a simple and intuitive graphical display that allows production as well as engineering staff to measure the phase difference between each of the four HD-SDI signals. The four-input phase difference measurement tool comes standard on this unit. The interface can display the phase difference in relation to an external source or HD-SDI input 1, depending on what reference the production is using. A simple cross-hair is displayed with a €˜green' marker to indicate the location of the four HD-SDI signals. Next to the cross-hair display is a detail analysis of the signal's phase difference. Once all four HD-SDI signals are aligned, the production team can start to align each camera as they would normally for an HD-SDI production. An alternative to the square-division method of 4K/UHD signal integration is the two-sample interleave method. This centres on sending two consecutive pixels to one of the four sub-images at a time. Among production teams considering the two-sample interleave method, the major concerning expressed to us is what happens if the sub-images are incorrectly routed. How will the crew know which two sub-images have been swapped over? 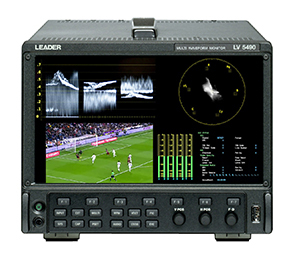 The LV5490 can read from the HD-SDI payload ID the sub-image ID of each HD-SDI signal. No error is reported because the HD-SDI streams are correct. On the status display of the LV5490, each sub-image ID is displayed, allowing an operator to check quickly and easily if any of the sub-images have been incorrectly routed. On Thursday October 15, the LV5490 was used by NEP Visions to capture in 4K/UHD a National Theatre Live production of Shakespeare's Hamlet with Benedict Cumberbatch in the title role. The stage performance was relayed live from the Barbican Theatre in London to Vue cinema audiences throughout Britain. On Saturday November 21, Media Burst (the systems integration division of the Mediapro group), chose three LV 5490 multi-screen waveform monitors for UHD coverage of the Real Madrid versus Barcelona football match in Madrid. The game was captured using 12 4K/UHD cameras delivering wide angle and close-up coverage from various locations around the Santiago Bernabeu stadium. The UHD feed was distributed via satellite by Hispasat using MPEG-4 AVC (H.264) compression encoding, and via Movistar+ to its fibre customers using the new HEVC (H.265) compression standard. With a number of high profile 4K/UHD productions scheduled for 2016, the LV5490 is rapidly establishing itself as a highly efficient and effective piece of test and measurement equipment.